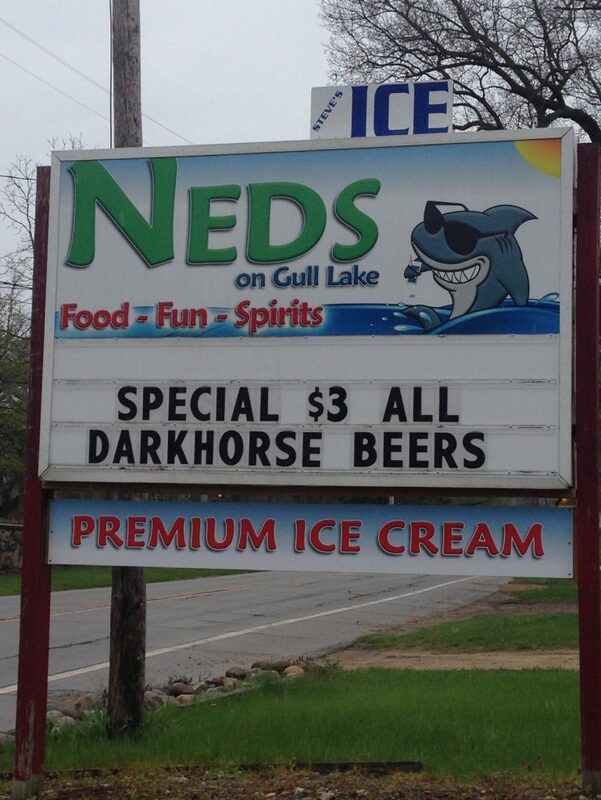 During a weekend visit to Michigan we had dinner at a little joint called NEDS on Gull Lake. And it’s little alright, maybe seven tables. 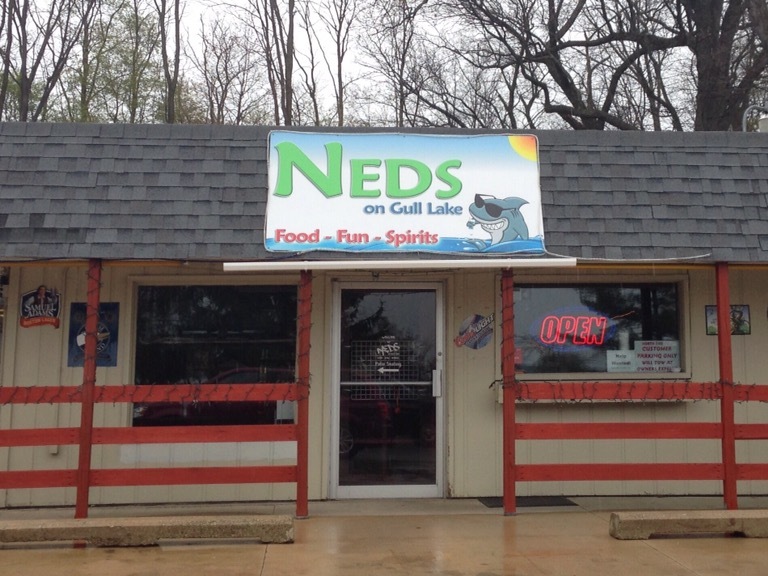 NEDS stands for North End Deli and Spirits ….It’s across from Gull Lake in Hickory Corners and from what I could tell does a huge take out business. There is a boat ramp across the road from NEDS. Apparently, they will deliver to the boat ramp if you call in an order. It’s the boat ramp at Prairieville Township Park. Our friends told us they like the pizza and went for it. I could see how this place would be hopping on a nice sunny day. The menu has a large variety of items including grinders, burgers, pizza and ice cream. We ordered some pizzas, smoked wings and cheese bread. The pizza has a thin crust and it was very tasty. My husband and I ordered half mushroom and half All meat. 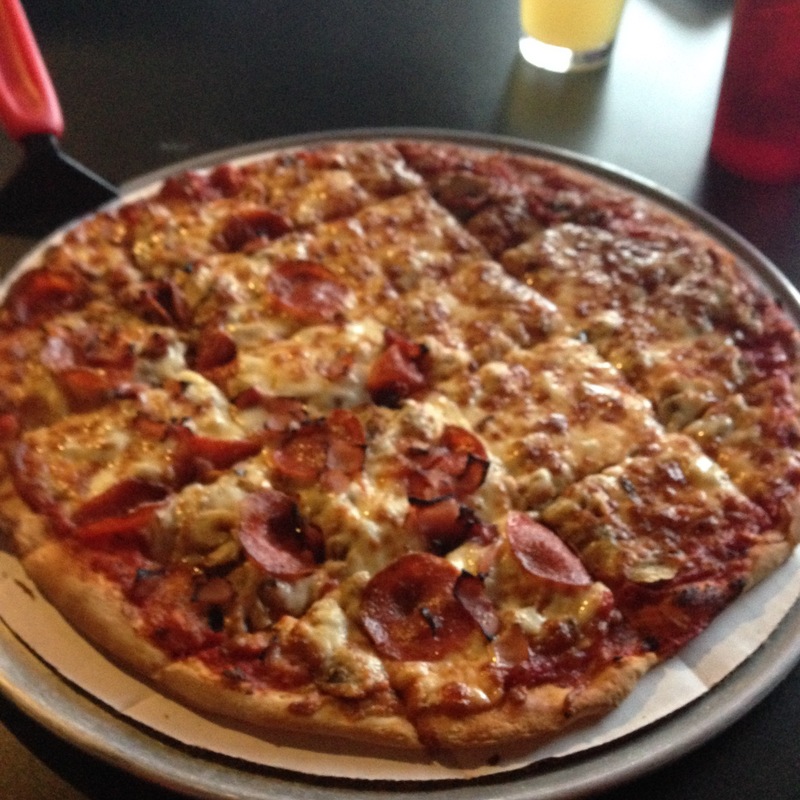 The All is pepperoni, sausage, ham and bacon with a four cheese blend. The halves became a little confused as there was mushroom with the meat side. I have a severe mushroom allergy by the way. So, we ended up ordering a small All meat just for me. Our friends told us they recently started selling draft beer. I tried a Vanilla Porter and it was yummy. 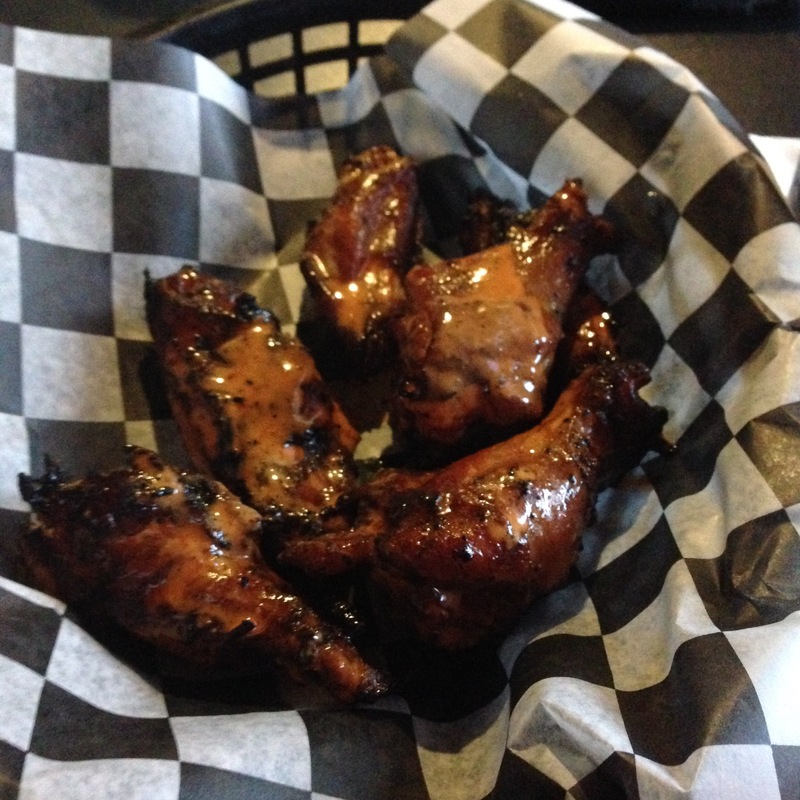 The smoked wings though….I loved those! They were prefect. Not greasy, nice smokey flavor and very tender with a light buffalo sauce. I think I would try to do this at home. They are in the appetizer section of the menu but I could eat these as a main course. In fact, this is going to be an experiment next week at my house. We had a bit longer wait than expected because our pizza was potentially lethal to me and I ordered a new one. But there were plenty of TV’s to watch in the mean time. I noticed a few items on the menu that I would have to say I’ve not seen before. Such as the Jalapeño Breaded Green Beans or the Rangoons filled with either Chili Cheese or Spinach Artichoke. Trust me…if I had room in my belly to eat more I would have taken a chance on these. Oh! Yeah, if you have a sweet tooth there is hand dipped ice cream for dessert. The kids had some Cookie Dough ice cream at the end of their meal. If you are ever up near Gull Lake (near Kalamazoo) I’d recommend getting some take out and finding a nice spot to picnic and enjoy the view. Of course if you have a boat that would be even better!